This page is continued from Part 1. Here's that Los Alamos street and trail map again so you can see the general layout of the mesas and canyons. 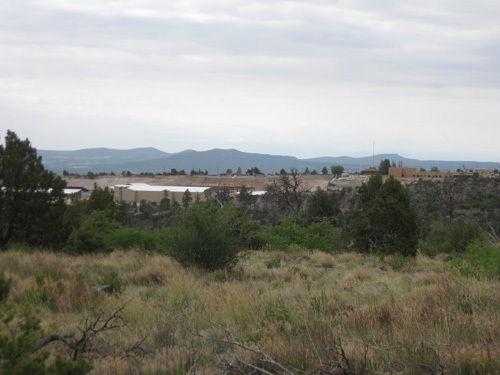 The Jemez Mountains are off to the left. Go to this link if you want a full-size map you can actually read. We settled in between two large trees, trying to take up as few parking spots as possible. By this evening, other runners arrived with their vans and campers to spend the night close to the race start. We needed to arrive before them so we'd have room to maneuver the camper -- and we'll have to wait until they're gone to leave. We've driven over to this location several times the past week, scouting out the parking situation, the first and last miles of the race course, other trails I could run, and the general lay of the land. 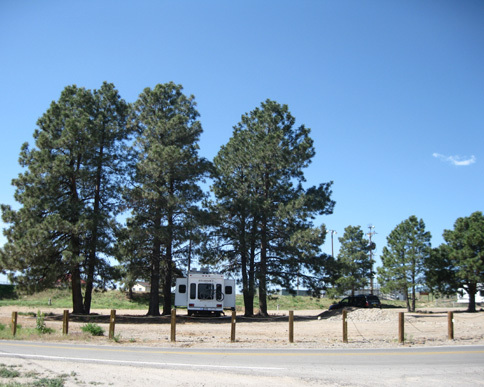 We liked our new dry camping "home" between an RV storage lot, baseball fields, and large stables where folks lease space for their horses (goats, chickens, roosters, etc.). 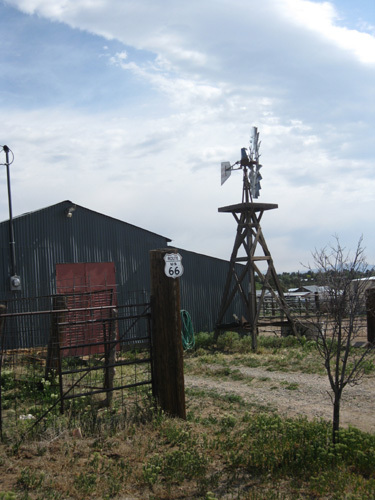 It's fun to run or walk through the stable/arena area and see all the various animals and types of barns and other buildings that have been added over the years. before making a left and dropping off on into Bayo Canyon, below, just across the gorge from the overlook at the end of the North Bayo Bench Trail. Too bad it's dark the first couple miles of the 50-miler and the runners don't get this great view of the canyon and Jemez Mountains! It is light by the time the 50Kers and half-marathoners start their races, though. I will have a great view out my living room window tomorrow afternoon as runners reach the top and dash toward the finish line. I took the next shot from our camper window, aiming the camera toward the Posse Shack (brown building, middle left). 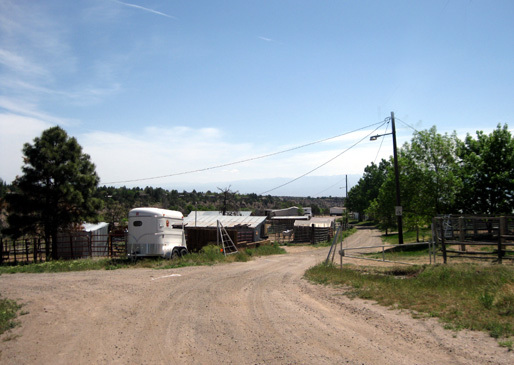 Runners will come up a trail to this road from the right and finish in front of the Posse Shack, a building used by the Sheriff's Dept. and other community organizations for various events. 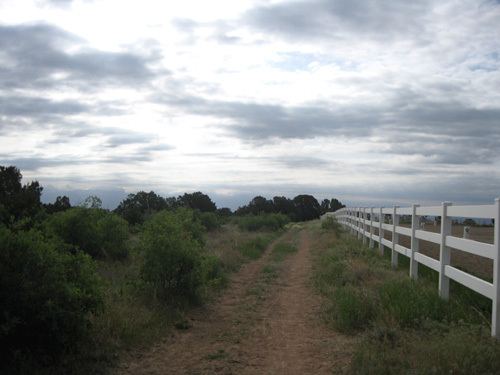 There are both paved bike trails and dirt paths on North Mesa. 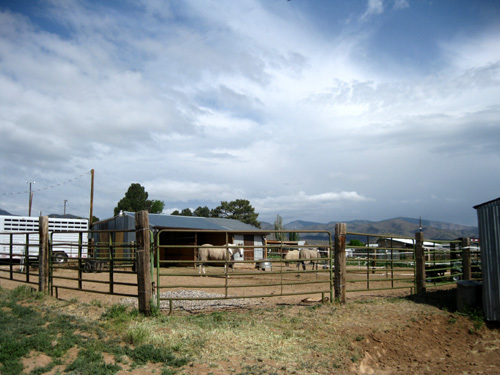 The dirt trails continue past the stables and arenas, below, to Kwage Mesa, a long finger of high plateau with more great views of the surrounding mesas, canyons, and mountain ranges. I found about four miles of fairly smooth, flat dirt roads and trails on this loop -- and they were right out our camper door! 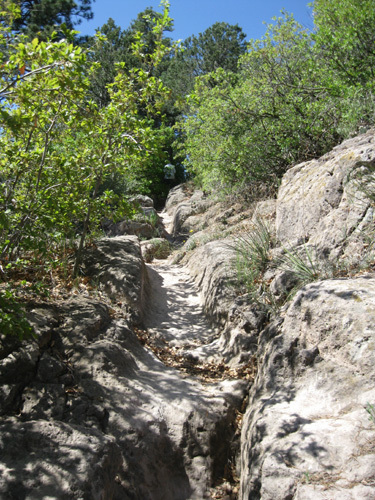 The trail is a loop with an out-and-back section. 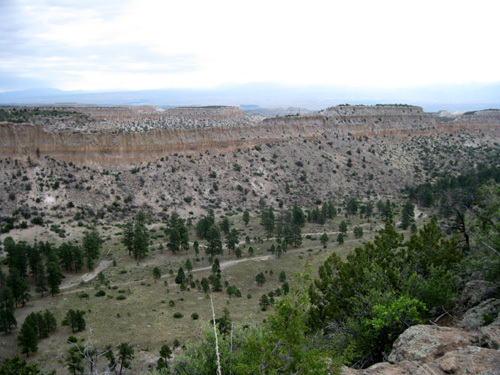 The north side of the loop consists of dirt road for over a mile to an overlook, below, at one "end" of the mesa. 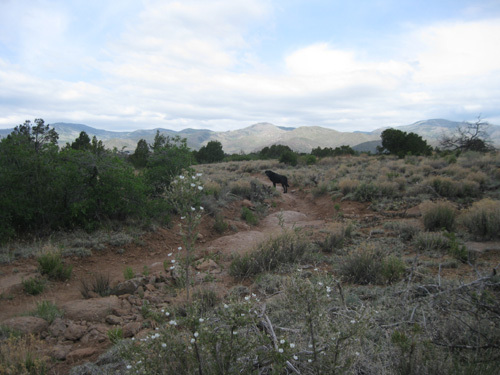 These mesas take off in all directions and usually have several "fingers" of various lengths, as you can see on the map above. 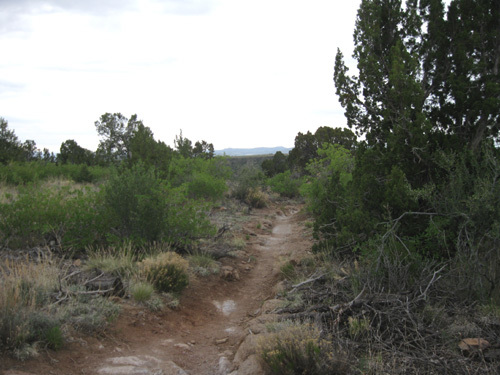 When I looped around to the south side of the mesa the trail turned to single-track. It is rockier and has more vegetation than the road section but it is still easy to run if you don't get as distracted by the views as I did! 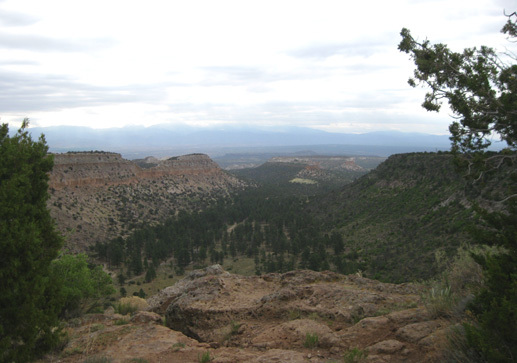 Next time we're here I want to explore more of the trails through other canyons -- and the correct one on Deer Trap Mesa. 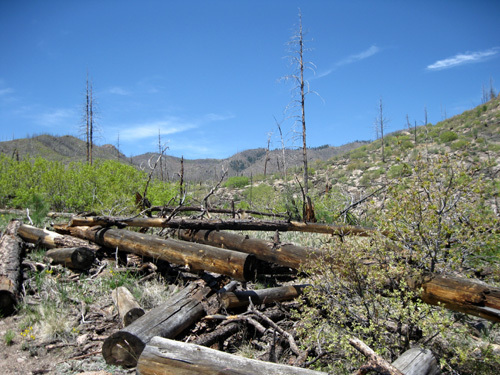 Jim and I both had two run/hikes from the Mitchell Trailhead at Arizona and 45th Street. 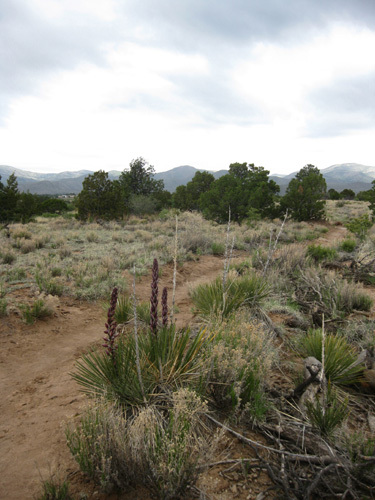 This is one of the main portals to the trails in the Jemez Mountains, right at the northwestern edge of town. 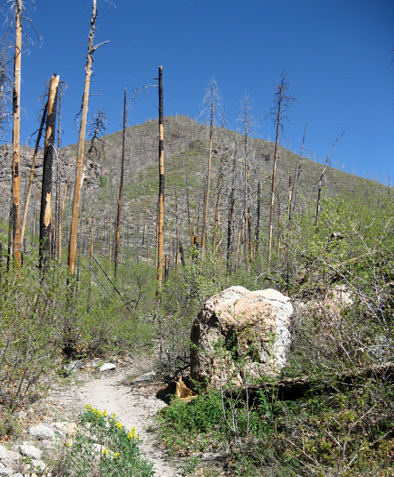 This is also where firefighters valiantly fought one side of the devastating Cerro Grande fire in May of 2000. The homes along the base of the mountains are relatively new, replacing some of the 400+ houses that were damaged or destroyed in that fire. Well over 40,000 acres of land were also burned. 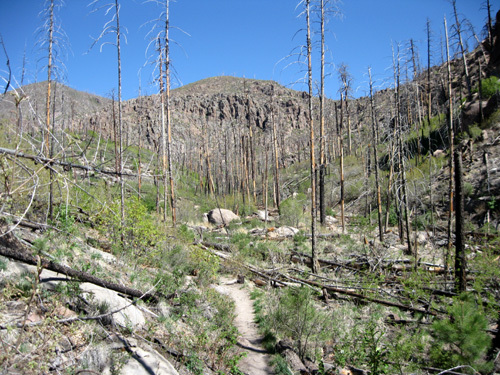 The Mitchell Trail and others on the eastern watershed of the Jemez Mountains travel through terrain that is still in recovery mode, with many snags yet to fall. There are caution sign all over the burned area warning hikers and campers that it often takes eight to ten years for snags to fall. It's now nine years since that fire! Be careful. The landscape is strangely beautiful despite the blackened tree trunks lying on the ground or reaching up toward the sky. 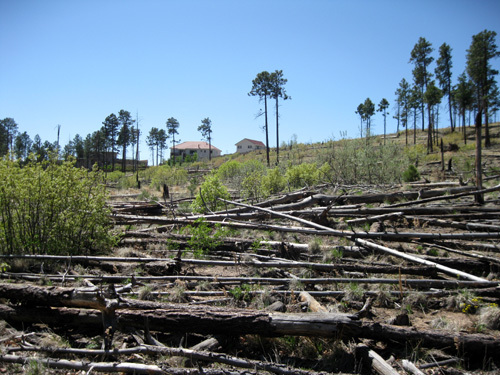 In some areas the downed trees are crisscrossed in piles as if a child had tossed a fistful of pick-up sticks into the air and left them just like they landed on the floor. The photo at the beginning of this section is a good example. 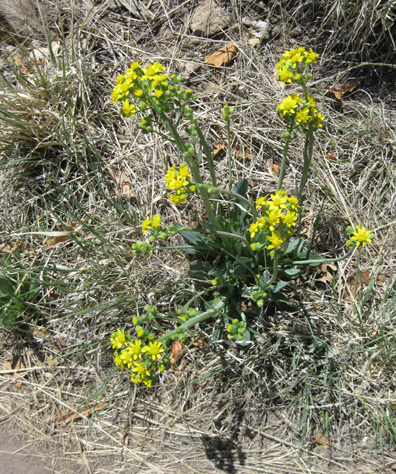 As soon as possible after the fire, volunteers planted native grasses and wildflowers along the trails closest to town to reduce erosion and jump-start the process of regrowth. 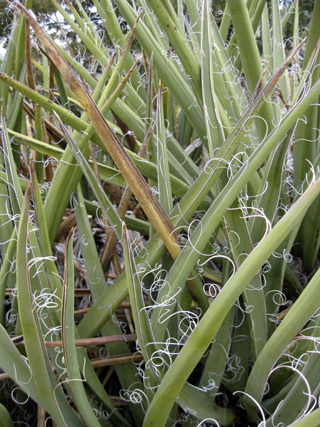 Enough time has elapsed now that new groundcovers, flowers, shrubs, and small trees like Gambel oak and New Mexico locust are beginning to fill in the gaps left by the fire. It will take a long time before these trails are shady again, though. I wish I could have seen these mountains before the fire, thick with dark green Ponderosa pines and Douglas firs that stood as tall as 150 feet..
No, on second thought, it's probably better that I didn't. I know many of the residents still feel a tremendous loss. 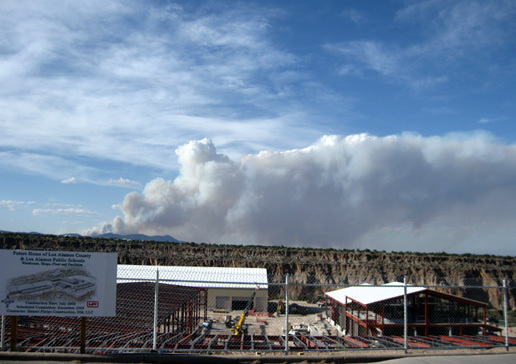 As an aside, Jim and I got rather concerned late yesterday afternoon when we looked out the camper windows and saw huge, billowing clouds of smoke behind a ridge of mountains to the north of Los Alamos. It wasn't all that many miles from town. I took pictures, of course. Oh, my! 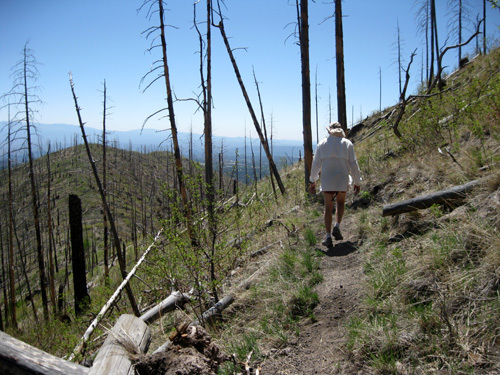 Was another part of the Santa Fe National Forest on fire again? 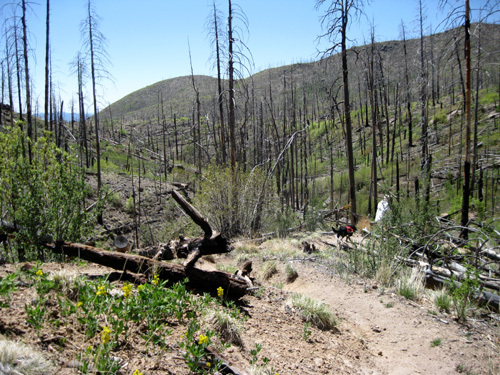 Fortunately, the Jemez Mountain race website had another photo of the smoke and explained to worried runners that it was a prescribed burn by the forest service, not a wildfire. That was both reassuring and a real surprise. I was out there running and walking for five hours yesterday and know how windy it was on the mesas around town. 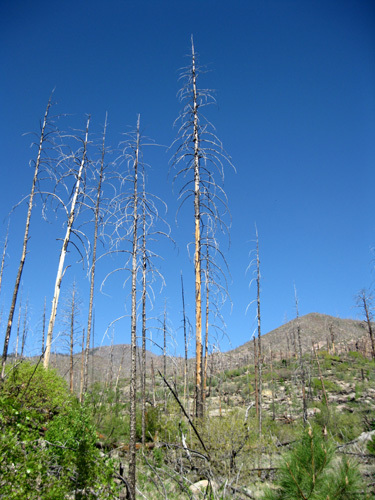 Although the canyons were calm, it seemed like a big risk to deliberately start a "managed" fire on such a windy day. But what do I know? I understand the importance of prescribed burns. 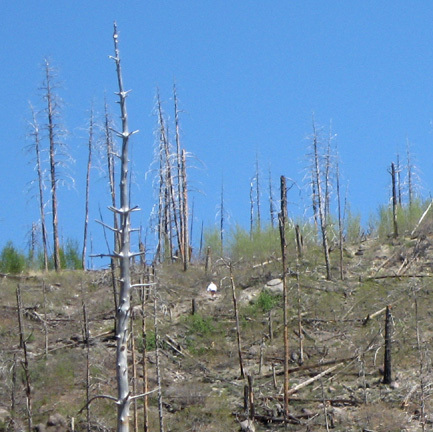 It's just that I've seen the results of too many natural (lightning) and arson forest fires that got out of control, and the timing of this burn seemed questionable. A few hundred feet up from the Mitchell trailhead you have the option of going right along the mostly-level Perimeter Trail or left on the gnarly Mitchell Trail, which ascends to Guadje Ridge. 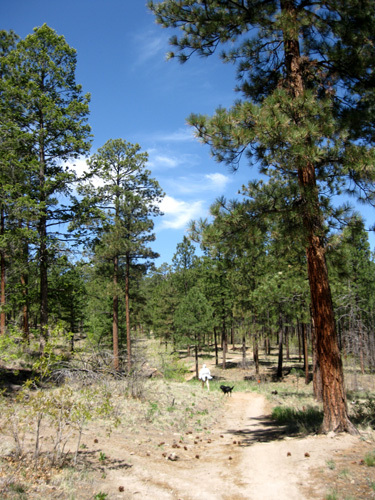 The Jemez Mountain race covers both trails. On our first run we chose the easy direction, a nice trail with some roots and rocks that undulates a little on its way around the northern end of town. 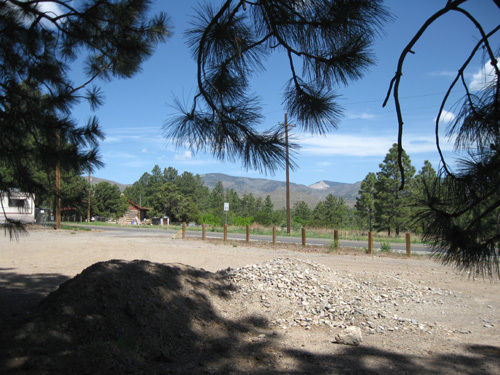 The four photos in the Mitchell Trailhead section above are along the Perimeter Trail, as are the next two. 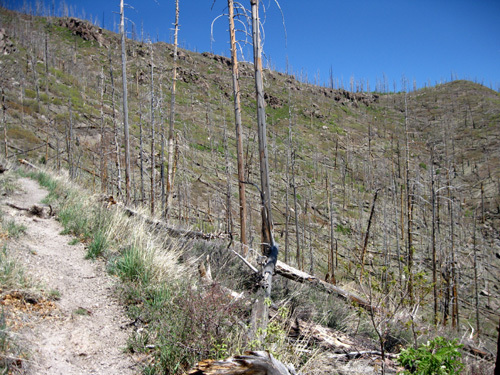 The trail started off through the burn area, then we got to the beautiful pines that were untouched. I know it's a worn out clich�, but the difference in the trail "ambiance" was like day and night. We passed the Woodland Trail and turned around when we got to Maple Drive. The race course continues on shady trails through Rendijo and Bayo Canyons to the start/finish area. 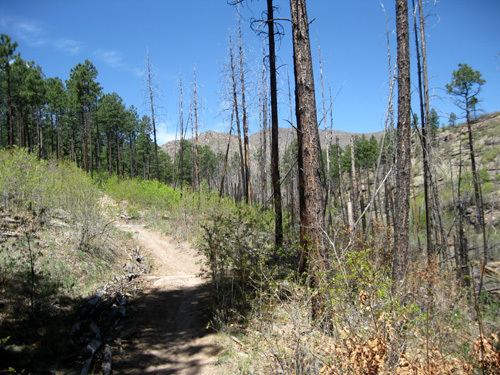 All three Jemez races go up this trail about five miles into each race but runners return to the finish a different way. When Jim and I did our training run on the Mitchell Trail, we went out and back. Cody and I didn't make it all the way to Guadje Ridge that day. Not only was I going slower than Jim, but also the terrain was steeper and more treacherous than I should be doing with knees that don't like to bend much more than 90 degrees. Outbound (uphill) isn't the problem; coming back down steep, unstable terrain is my problem. Jim went on ahead another 4/10ths mile to the top of the ridge and scouted out the intersection up there so he'd know where to go on race day. Not that that would be a problem -- our friend Sandy Powell and another volunteer (wo)manned that aid station on race day with professionalism, panache, and persistence. With three races and repeated trips through the Guaje-Mitchell Aid Station, they probably served runners close to a thousand times all day and into the night. In addition, they had to hike up well before the first runners reached their aid station, wait to hike back down in the dark until everyone came through, AND carry a bunch of stuff both directions! That's 'way above and beyond. Thanks, you two! Long zoom shot of Jim nearing the ridgeline; the aid station will be on the left during the race. I'm sorry I missed the panorama visible on Guadje Ridge. 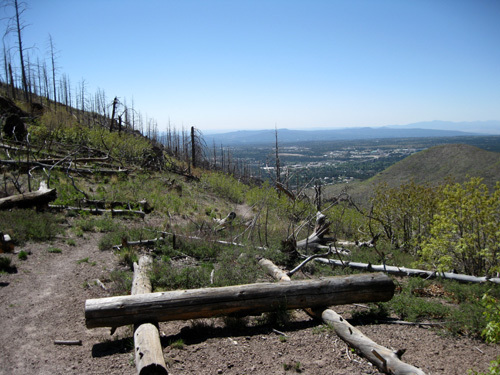 There are scenic views toward heavily treed, unburned mountain peaks to the south, north, and west that all the runners got to enjoy. Jim didn't carry a camera on this training run or during the race so we don't have any shots from that location. 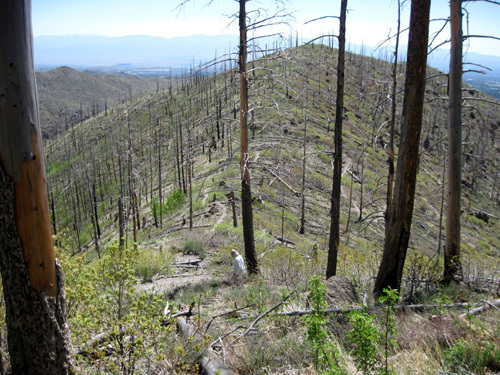 However, the views north, south, and east from the false summit and other parts of the trail I was on are fairly scenic, too -- even without the trees that used to be there. After I made it back down some steep trail with loose rocks and sand to the false summit, I was able to run most of the way to the parking area. In the 50-mile race on Saturday, Jim would continue going northeast along Guadje Ridge on the return and come back to the finish a different way. 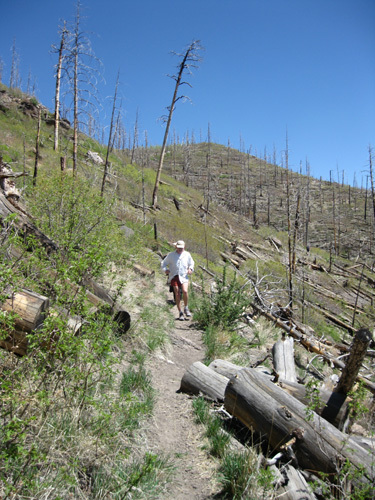 I'll show more photos from the Mitchell Trail in the next entry about the Jemez Mountain Trail Runs. 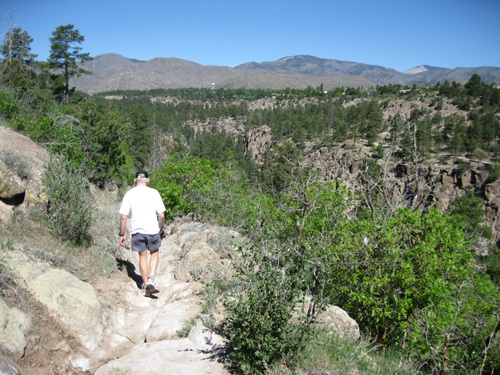 There are at least two types of trail maps for Los Alamos County, which includes the town of White Rock. We got ours at the visitors' center in Los Alamos. Because it also included streets and was printed in a non-topo format, I found the map put out by visit.losalamos.com to be easier to read and follow than the glossy one from the parks department. 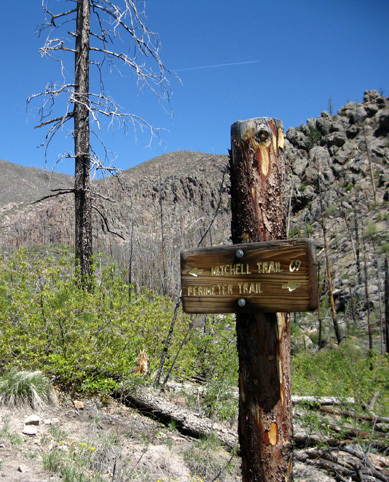 The latter has good information about the length and difficulty of the most popular trails, however, so I recommend consulting both maps to get the most complete "picture" of the trail network.